Not counting the brief interruption to regular programming by Hurricane Harvey, our Houston lives are settling into a routine. The kids are back in school, activities are underway, the house is unpacked albeit un-decorated but that will come with time. I am in a new phase of life. Fortunately, I did qualify for Employment Insurance so there is less urgency for me to find a job which is a good thing because I still can’t decide what I want to do when I grow up. All this leads to completely different wardrobe needs and a new reckoning of my personal style. My blazers sit untouched, even in “Fall” I can hardly imagine wearing pants in the Texas heat, long sleeves make me sweat just looking at them. Every morning and afternoon, I walk my kids to the bus with all the other parents and note the prominent fashion choice of athleisure wear (there’s an oxymoron for you) which is NOT happening. I am out and about each day but not necessarily seen by anyone which has led me to a realization: up until now, my style choices were in good part due to being seen by others. 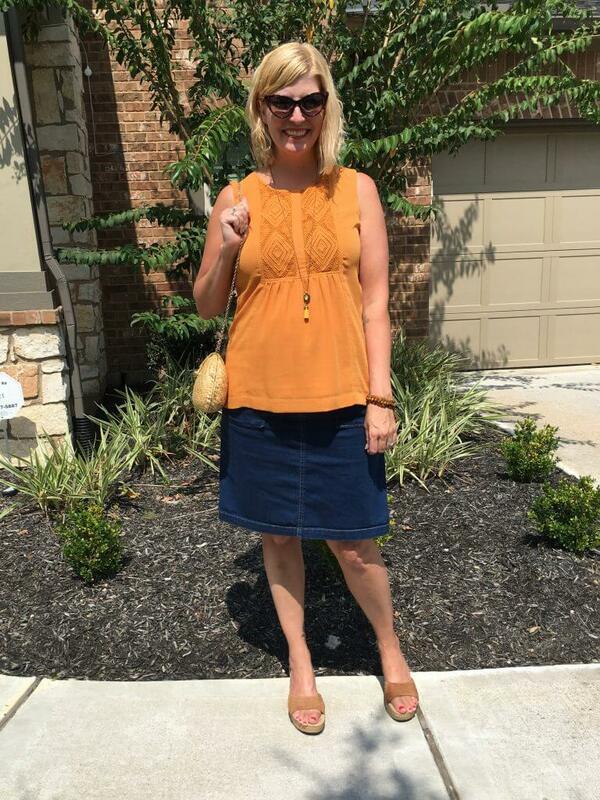 Not that I was looking for approval because I’m over 40 and I beat my own drum… Maybe so that I could share my thrifting scores?? Maybe for the sheer vanity of getting compliments? I don’t think that’s inherently wrong – everyone likes a sincere compliment (preferably not only related to one’s appearance but also to one’s character, but I’ll take either!). In any case, without having my work ladies to “dress for,” I have been feeling adrift. 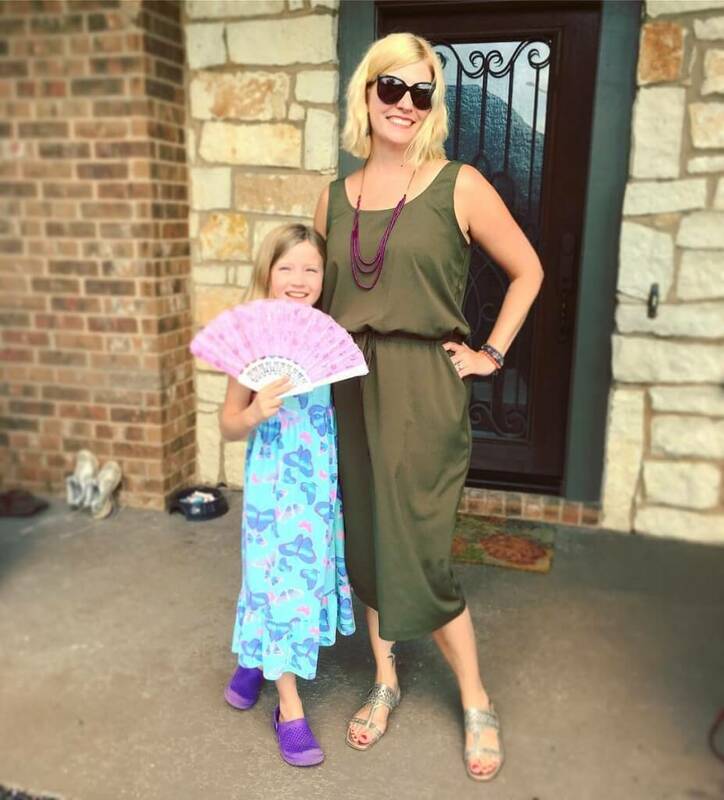 I have encouraged stay-at-home and work-at-home women over the years to embrace their personal style, put some effort into themselves and put on a damn necklace! Now here I am with the shoe on the other foot so to speak and finally understanding the effort that takes. If a tree falls in the forest mom wears a stained tee and shorts and no makeup, does anyone hear notice? Truthfully, no. No one notices or cares unless you happen to have an attuned husband or teen-aged daughter perhaps, neither of which apply to me. However, I notice and that, after all, is what really matters. There is a little itch that tells me if I’m not dressing for work, it doesn’t count and so I declare here and now: every day counts. Every day is a chance to impress a little bit of YOU on the world and to that end, the effort is entirely worthwhile. Comfortable pieces – flats, looser dresses in a casual fabric, nothing that requires a strapless bra. Yes that means some of my “work clothes” are going unworn and that’s okay. They still spark joy for me just hanging there so there they will stay for the time being. I actually didn’t intend to wear this “out” but then thought, whatevs. 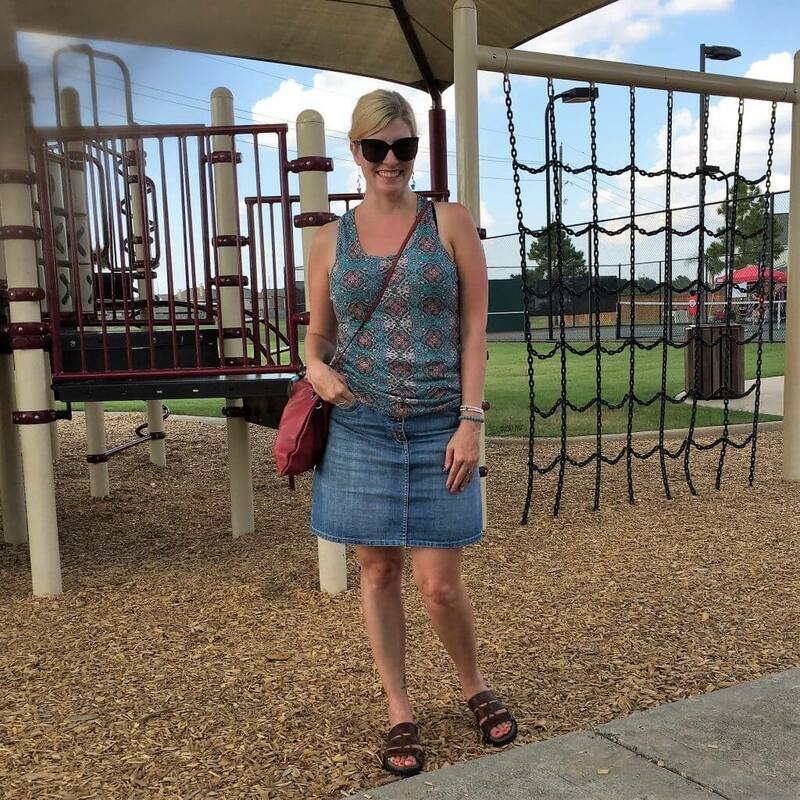 I wore it to the neighbourhood block party and realized that proper Houston playgrounds are covered BECAUSE IT IS SO HOT. I’m not sweating, YOU ARE. Nope, I am too. A lot. 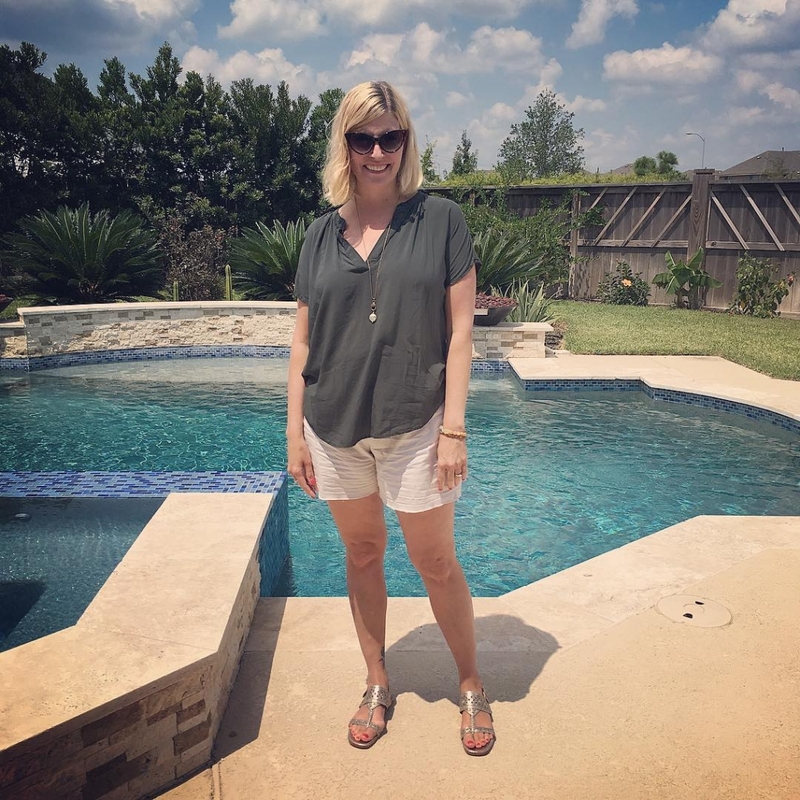 Shorts – I’ve favoured skirts over shorts in the past but most of my skirts require tops to be tucked in and that just feels constricting so I’ve been reaching for shorts more than ever before. Interesting pieces – I am still drawn to prints and pieces that offer up something to complement my, er, substantial wardrobe, though, like I said, a fair amount of my wardrobe is out of rotation, indefinitely. That totally justifies me thrifting more, right? Got this orange top for $4.19 because I don’t have an orange sleeveless top and I liked the interesting detailing. Worn with my $3.93 Ugg slides, $2.50 Levi’s denim skirt, $6.56 vintage clam shell wicker bag, $2.10 sunnies and She Does Create accessories. Accessories – I still love necklaces but find I am not wearing them every day. Earrings and an arm party however are my jam. I do wear them every day and feel naked without them. I carry a scarf in my bag to cope with the icy AC but otherwise forgo scarves due to the heat. Too bad because I find they add a finishing touch on many outfits. Maybe sometime in December??? Okay, I wear necklaces almost every day! I just can’t quit you. 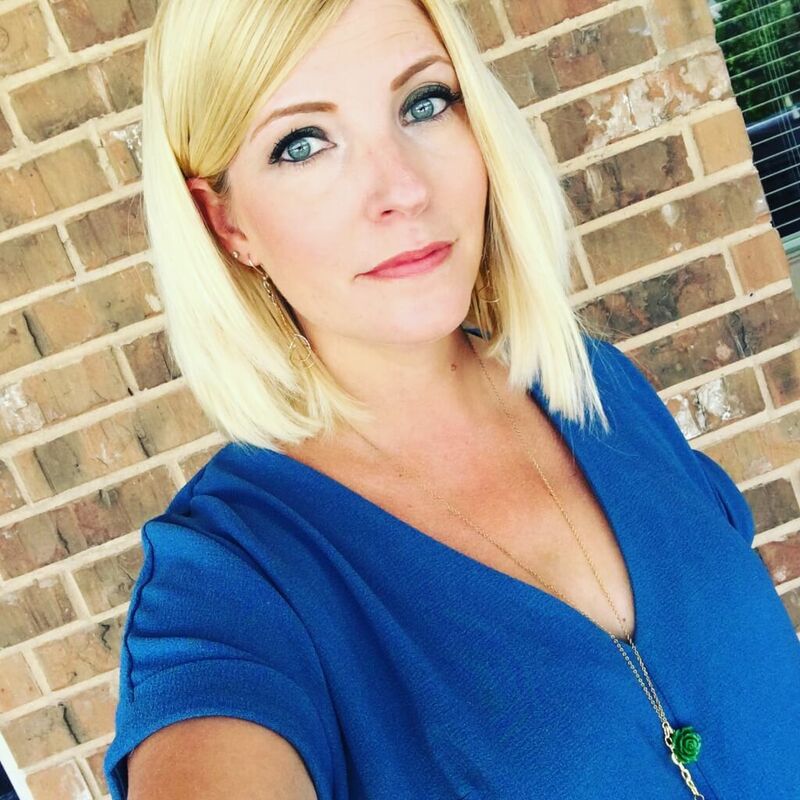 Getting ready – I am a make-up girl so I still wear makeup every day though I made the necessary switch to waterproof mascara (and am seeking the best – any recommendations?). Hair is another story. I cannot bring myself to blow-dry, straighten or curl my hair. Any given day has a 90% chance of pool and/or sweat-dripping humidity so hair styling efforts are literally washed away. I finally found a stylist here – a Canadian from Leduc back home!! She fixed up my roots, added some layers and shared that it took her a good year before feeling truly settled. I’m not crying, YOU ARE. Nope, I am, a little. It is so very relieving to hear. Given this new direction for my personal style, I am just not driven towards blog posts showcasing my outfits. My friends and family back home enduring the snow might start sending hate mail if I blog too much about my seemingly endless summer style! Sooooo, I’m still posting details of my outfits on Instagram and enjoying IG Story to share my random musings. And I still plan to blog my thrifting adventures and any other style (or other) idea that interests me and I hope that is compelling enough for y’all to follow along. Otherwise, I am open to suggestion so if you have something you would like to see or a topic you’d like me to explore, please comment or email me! It is truly inspiring to hear from you and comments make my day! 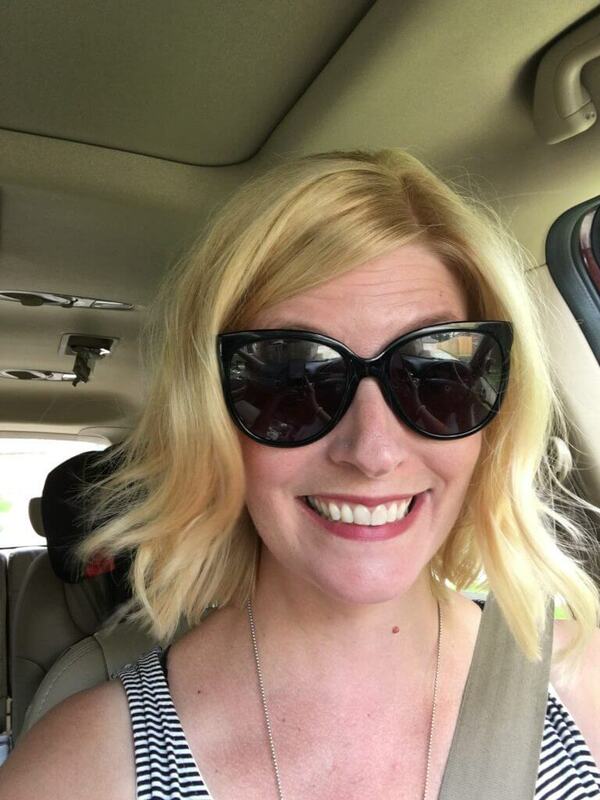 I love reading all of your posts whether they are about thrifting, dressing, shopping, settling into a new life, your kids. Basically anything! Keep posting, you brighten my day! Thank you for the encouragement! It helps me feel okay about posting on topics other than clothes! Thank you for your comment – it truly does motivate me! Keep up the good work. Your stories about thrifting are interesting and inspiring. Thank you so much! And will do! I have seen the thrifting community grow exponentially and it is wonderful! Would love to see how you thrift decorate your new home. Do they count when you find them on line then try them out? I always cite my sources but then worry someone’s gonna sue me!! GAHHH I’ve been living here for less than 3 months and already I have litigation-glasses on!! I always love your thrifting / thrift haul posts. I hope they will continue even as your wardrobe needs have shifted. 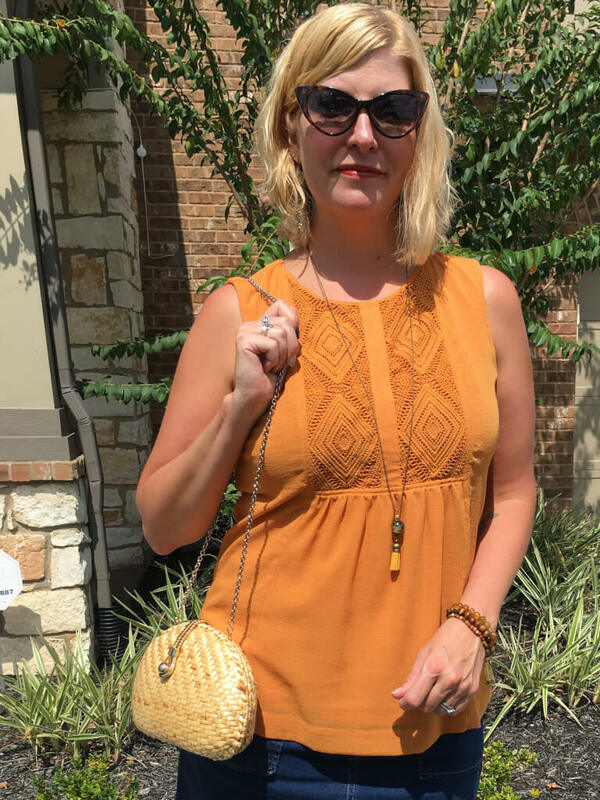 One of my local Goodwill blogs has a series where they show a $1000+ designer outfit compared to a comparable thrifted outfit, which is always fun. I was just thinking that I had shared some of my thrift hauls on IG story or in specific blog posts but not everything. I will have to do a summer recap and then get it going on again! What is the name of that blog? I have thought of doing a “look for less” series too! Love that kind of thing. Thanks for the suggestion and for your encouraging comment! It’s the Good Life (South Carolina Goodwill) blog. I am not particularly a fan of how they do the “look for less” (it’s not detailed enough, which is perhaps why I am wanting for more!) but they have some other good thrifting posts, too. Work wise, a new career direction might be writing. Perhaps an e-book on the basics of thrifting? Or maybe some articles for magazines on thrifting (tre-trendy!) or perhaps your previous profession as a therapist? 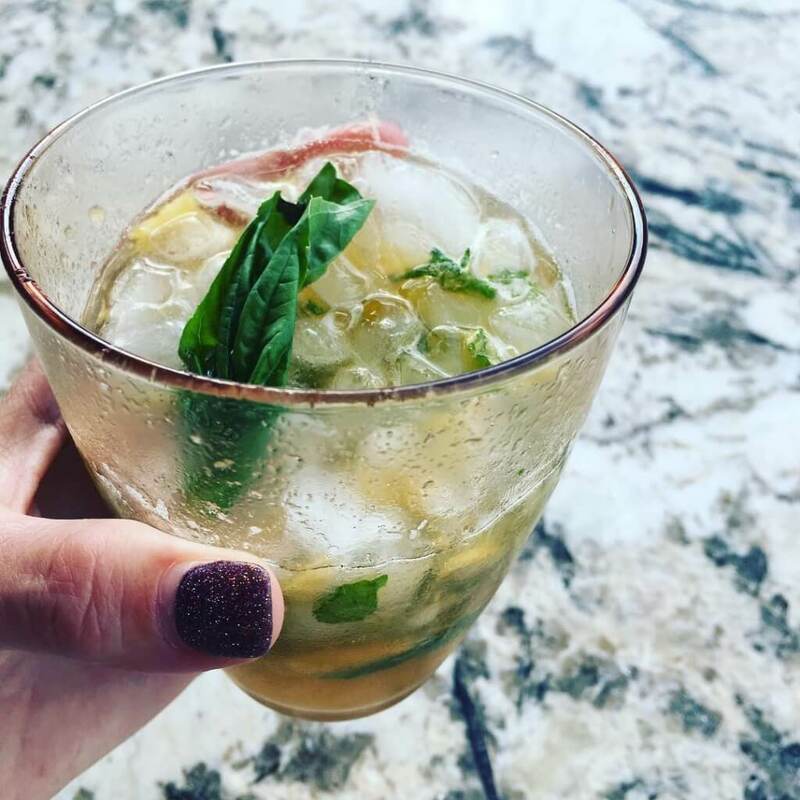 Oh, and don’t forget the cocktail recipes! I definitely plan to blog about my decorating (mis)adventures. I do browse the decor whenever I go to the thrift store but the floods here have thrown a wrench in things. I feel decent secondhand furniture should go to those who have lost everything, and I’m simultaneously wary of buying decor or furniture secondhand (especially off Craig’s list/kijiji) in case it was affected by the floods. A second compounding factor is that we have evacuees with us so are still in a bit of limbo. We are very happy to be able to host them but I might wait until they are settled into their restored home before I jump fully into decorating ours. Thank you also for the encouragement about writing! My friend Elisa says the same thing!! I’m starting to wonder if I need to give it some serious thought! I will have to explore some options and give it a go. Stay tuned! Thanks for the encouragement and for commenting. I truly find them helpful and motivating! thrifting, shopping, fashion, getting settled in a new community–please continue blogging. you are sunshine. thank you! Well that is such a nice thing to say! Thank you for your kind words! I will do! I need an outlet to process some of the differences (and thereby avoid angry letters to people in authority :D!!!). Thank you so much for your comment! It does keep me going! hee hee, it’s a thought!! Stay tuned!! Thanks for commenting! I love to see your thrifting Adventures. I would love to see your House decorating as well. 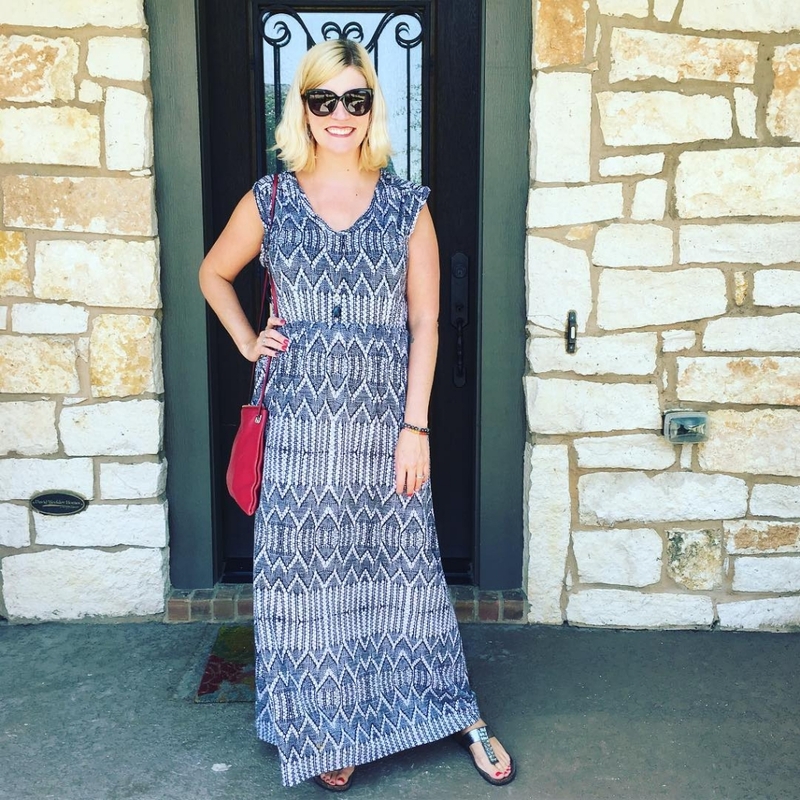 But back to clothes, I would love to hear about how you put together wardrobe, I would love for you to talk about why you put different pieces together, some general tips on thrifting to find quality pieces, and how to dress fun/youthful in your 40s. And makeup, tell us more about your makeup, which always looks fabulous. Thanks for sharing, your blog is one of my favorites. Thank YOU for your kind words! I will surely share the decorating whenever it occurs!! The other topics are awesome – thanks for the suggestions! I did make a foray into the Instagram makeup world during my foot surgery recovery last year under the user name “makeup over 40” but haven’t touched that in months. I will touch base on it here along with the wish that we had filter glasses LOL! Thanks again! I still love to see your clothing posts. You are the inspiration that has encouraged me to dress ‘work from home’ appropriate for years. A change in wardrobe for sure but us stay at home mom’s and workers still need inspiration from you!! You are such a clear communicator! I’d love for you to invite someone in your life to coffee once a week and know how in the world you start that process as well as endure that process. And what you wear – because it’s just coffee inbetween running errands/kids. That’s a great idea Laurie and gels with another that I’ve had to write about the people I’m meeting. I am truly loving meeting people and learning about their stories. Maybe you wanna be my first coffee date?!!! :D!!!! !